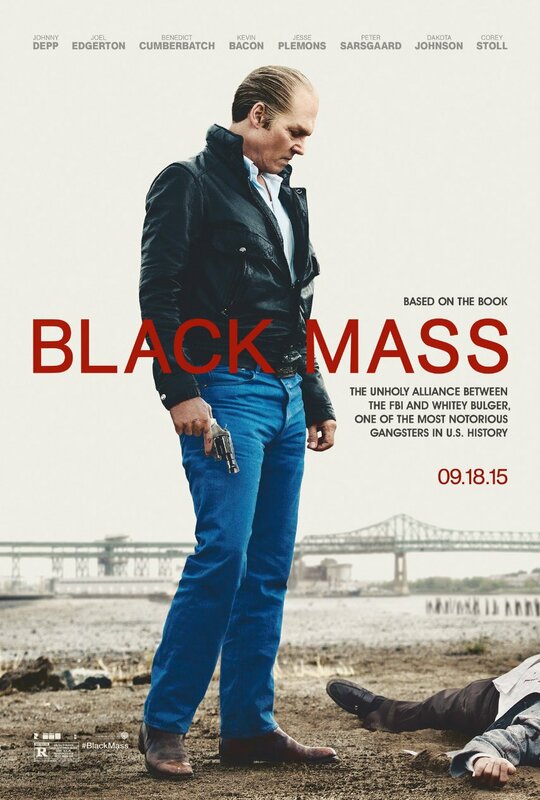 Black Mass tells the story of James Whitey Bulger, played by Johnny Depp, an Irish-Amercian mobster who operated out of Boston in the 70s & 80s as the boss of the Winter Hill Gang. He became involved with the FBI as an informant through an officer named John Connolly played by Joel Edgerton, and essentially enjoyed protection from prosecution as he grew his empire, supposedly in return for intel on other criminals. As far as I can tell, the Black Mass of the title refers to the fact that Bulger was effectively cancer to everyone he came in contact with. His sociopathic criminal behavior tainted everyone around him – family, friend and foe. While many critics seem unconvinced by Depp’s portrayal off Bugler, I was absolutely mesmerized. In the film, Bulger justifies the loathsome decision to provide intel to the Feds as just business. Depp’s Bulger draws influence from Christopher Walken and Jack Nicholson, particularly relevant as Jack’s charcter in The Departed – Frank Costello is loosely based on Bulger. Like James Gandolfini’s character Tony in The Sopranos, everyone that Bulger comes into contact with fall under his spell either though charm or coercion, none more so than the FBI agent played by Edgerton. I can see Depp receiving an Oscar nomination for his portrayal of a real life gangster, and in a year full of real life roles, from Steve Jobs, to The Walk, it will be interesting to see who wins.